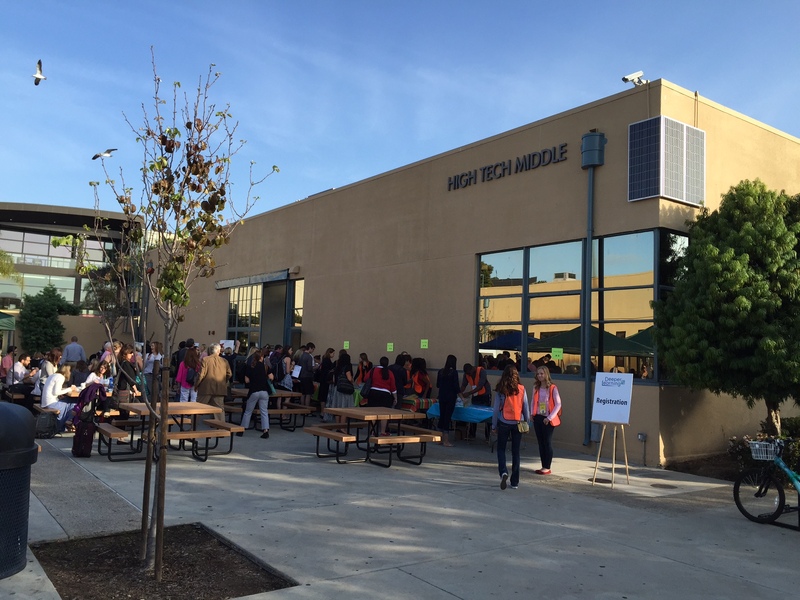 Well High Tech High knows how to throw a conference, that’s for sure. 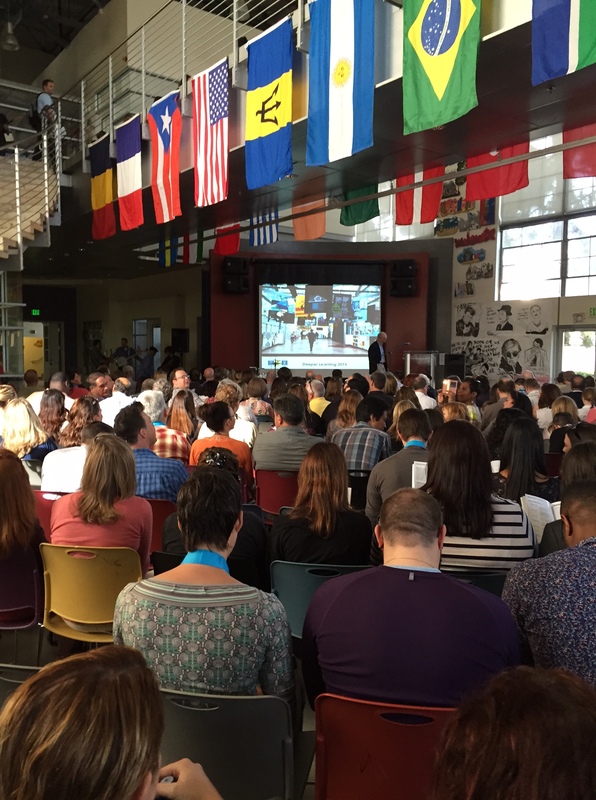 Audience for keynote address Day 1 of Deeper Learning 2015. 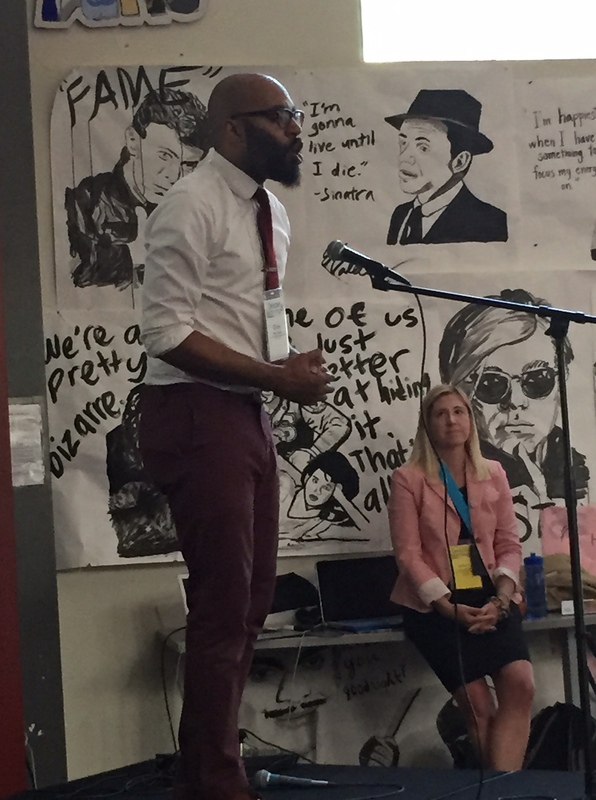 Deeper Learning 2015 got off to a roaring start yesterday with a keynote address by Christopher Emdin, Associate Professor in the Department of Mathematics, Science and Technology at Columbia University’s Teachers’ College and dynamic TED talk speaker. Chris Emdin delivers keynote address surrounded by HTH student work. 1. Cogens: Hold cogenerative diaglogues. For cogens, a teacher selects a few students who represent distinctly different demographic groups within the classroom – perhaps struggling versus excelling, minority versus majority ethnicity, or students from different social roles within the school – and then has them come together and talk about and to the teacher concerning the experience of being in that classroom. Intimidating for the teacher, absolutely. But likely the best and most useful forum for constructive feedback that a teacher will ever get. One or two observations by a formal evaluator, or even a peer evaluator, are unlikely to give you as complete a picture of what your classroom actually looks and feels like every day, or as accurate a sense of what your students need to truly learn. 2. Coteaching: Take opportunities to turn the teaching over the students. Give them the learning objectives, the content objectives, and some resources and ask them to plan and implement the lesson. We all know that teaching is the best way to learn! As a bonus – just as cogens allowed you to experience what your classroom feels like for students every day, being asked to actually deliver a lesson will allow your students to see the teaching and learning experience from your perspective. 3. Cosmopolitalism: Meaning ensure that students are invested in the social dynamics of the classroom by establishing a role and responsibility for every student in that room. This is group roles and norms writ large. Chalkboard/whiteboard eraser, equipment distributor, countertop cleaner, whatever – any task that keeps a classroom running and working, and which therefore has tangible value, is fair game. We aren’t used to thinking of this technique as having power for high school students (Kindergarten – sure! But older kids? ), but Chris convinced me, describing students who stopped cutting class because other students were texting them demanding they show up so everyone could get their paper, and a young women who at the last minute forwent the opportunity to go on an out-of-town trip because she was concerned that in her absence no one would be able to get and use their microscopes. 4. Context: Make the content, projects and overall experience organic and homegrown by focusing on the local community and environment. 5. Content: Recognize that content expertise, the ability to “know what you don’t know,” and the willingness to admit it – are all equally crucial for both teacher and students. 6. Competition: Everyone loves a good showdown! 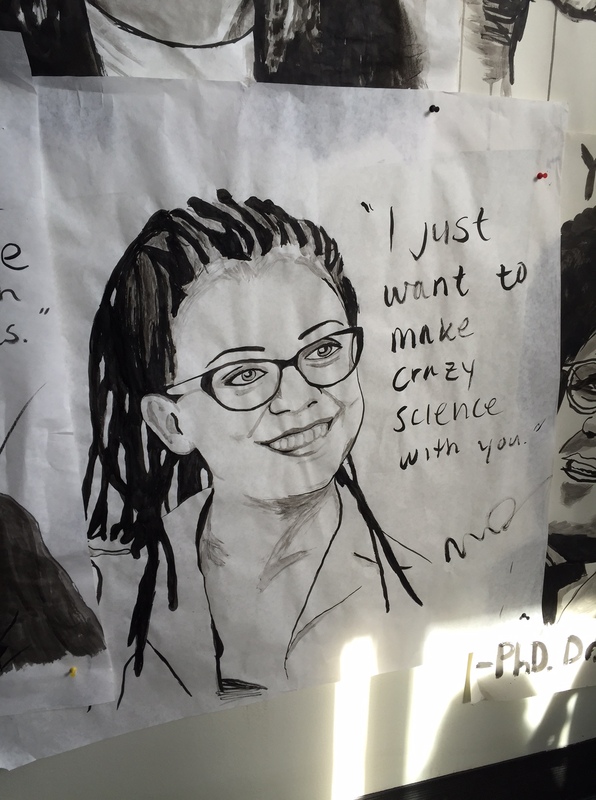 So let the students show each other what they can do and thereby vie for bragging rights. Many of these suggestions may sound like familiar territory – but some may spark new ideas and approaches. Saw this HTH student work on the way into the keynote. Loved it!!! !